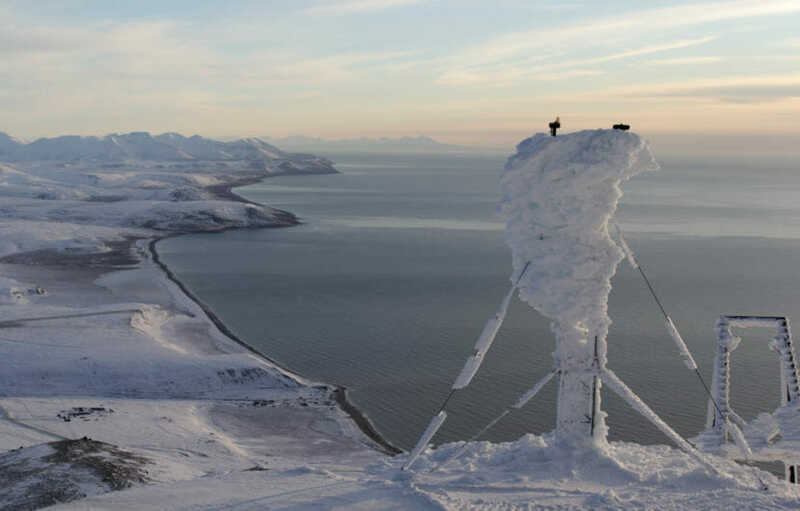 Across Alaska, 15 remote radars spin every minute of the day, 365 days a year. Since the Cold War, they’ve monitored the airspace above Alaska and across much of the Bering Sea and Arctic. Even with decades of technological advances, the radar system is still the military’s primary way of consistently monitoring airspace over a huge swath the continent. The radars give military stations in Alaska and the Lower 48 visibility of airspace they say is crucial for maintaining U.S. sovereignty. 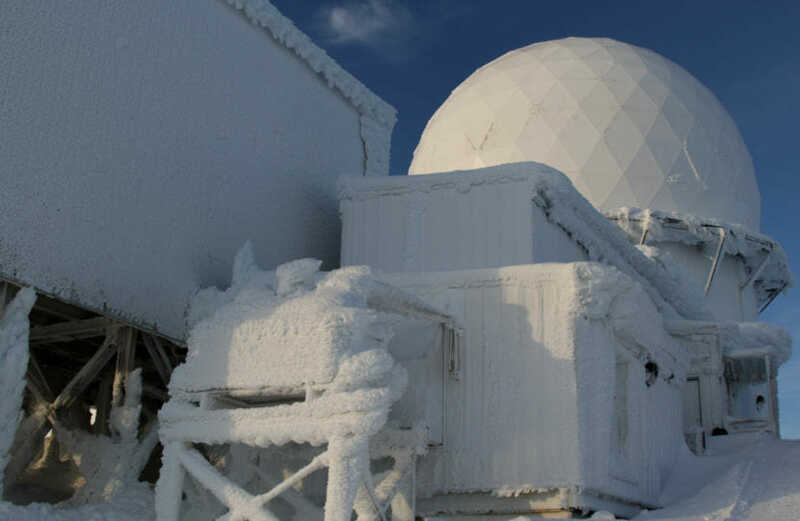 Even with the Cold War over, the radar system has absorbed more civilian functions into operations, feeding information to various federal agencies. But now, there is a new threat to these frontline monitoring stations: climate change. When the radar sites were selected in the 1950s, along coastlines and deep in the Interior, melting permafrost and coastal erosion were not yet long-term strategic concerns. Now, even as the Defense Department acknowledges the problem, there are few solutions for how to cope with it while keeping the radars operational. 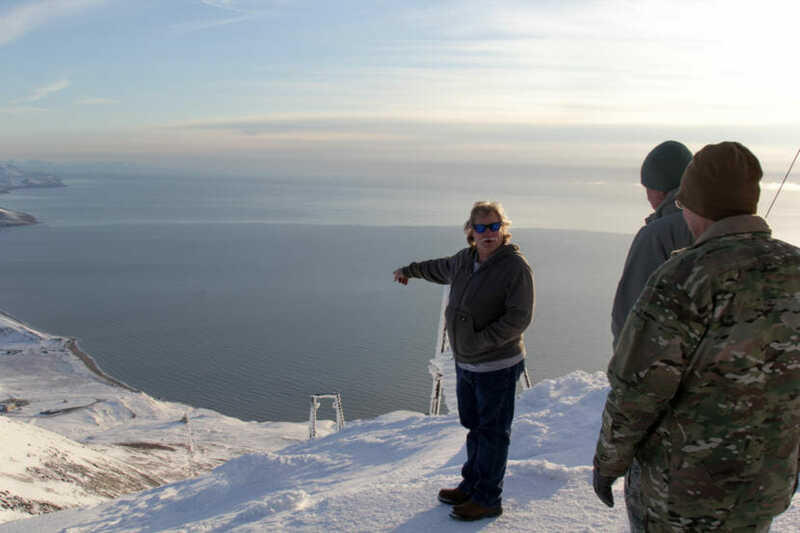 One of the most dramatic Alaska radar sites is at Tin City, perched at the farthest edge of the Seward Peninsula, just across the Bering Strait from mainland Russia. Even with ideal weather, it takes hours to get there, starting with a 630-mile trip from Joint Base Elmendorf-Richardson aboard a compact Air Force C-12 plane. And with the exception of very dramatic emergencies, there are no bathrooms on board. “Our flight time today is just a couple hours, so hopefully everyone will be good there,” the pilot explained optimistically. In the early years of the 20th century, Tin City hosted a small mining town — they mined tin. The location is inhospitable for even small-scale industrial operations, battered by cold winds, hammered by storms and miles from the closest Native communities, Wales and Shishmaref. But since the 1950s, Tin City been the site of a long-range radar managed by the Air Force. It used to take well over 100 Air Force personnel to manage these sites, most of them young men (no women or children were allowed) from the Lower 48 serving out one-year hardship posts and doing their best to combat the deprivation and monotony. Over the decades though, automation, improved technology and privatization have whittled down the number of personnel to just four civilian contractors. 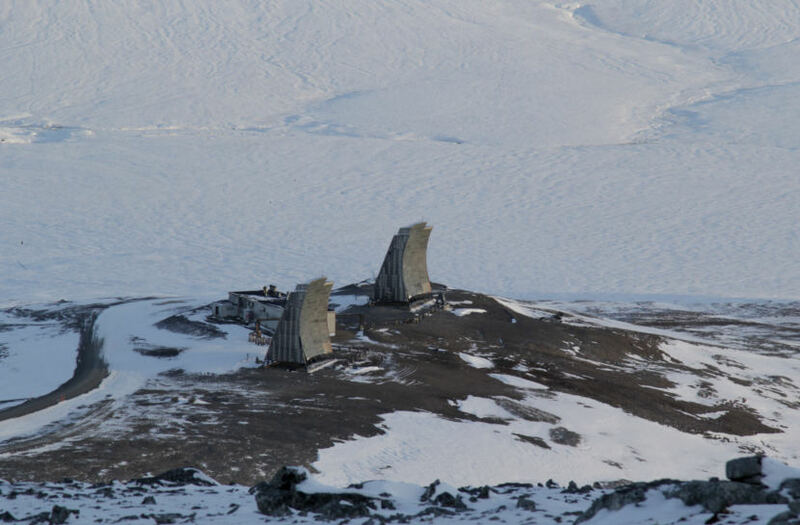 ARCTEC, the defense firm in charge of staffing and supplying most of Alaska’s radar stations, manages a contract worth $384 million over 10 years, according to Air Force Col. Daniel Lemon, the commander in charge of remote radar stations from the Pacific to the Arctic. After landing at Tin City’s airstrip, we are greeted by a few pickup trucks. Site technicians like Tom Broughton give us a ride up toward the lower camp, where there’s a long, squat building housing their beds, cafeteria, workout gear and caches of equipment. “I live here nine or 10 months out of the year,” Broughton explained. On this particular day, he’s on his way out. Typically, site techs can only leave every few weeks when supply planes land. But Tin City is fortunately situated right in the middle of local commercial flight paths, giving employees a relative preponderance of options for departure. Broughton’s heading home to a small town in southwest Wyoming he shares with his wife. Generally, ARCTEC employees work several-month stints at the sites, punctuated by long reprieves at home along Alaska’s railbelt or in the Lower 48. Running these radar stations has never been easy, but now it’s getting even less manageable, as coastal erosion nibbles away the land around vital infrastructure supporting the sites. “I’m a military officer, so global warming? I dunno,” Lemon said with a shrug during a briefing about the sites. The admission was aimed at humility, denying that in his position he had the authority to offer grand scientific explanations. But for almost a decade, the Defense Department has acknowledged that a rapidly-warming climate poses a threat to the military’s installations and operations around the globe, and they’ve initiated plans to cope with it. So far, three radar stations, all of them in the North Slope, are grappling with climate-driven threats to infrastructure. The installation at Tin City is not immediately imperiled by this issue. However, during our visit in mid-November, the Bering Strait, easily visible from throughout the lower camp, was an uninterrupted dark blue, the water completely free of sea ice. After a quick lunch of cheeseburgers and coffee, the small crew of visitors headed up to “top camp,” up a steep mountainside where the actual radar sits. Next came a half-hour trip up snowy switchbacks that looked like they were about to drop away at every turn, the angle of ascent aggressive enough that most Alaska trucks would have been quickly defeated. 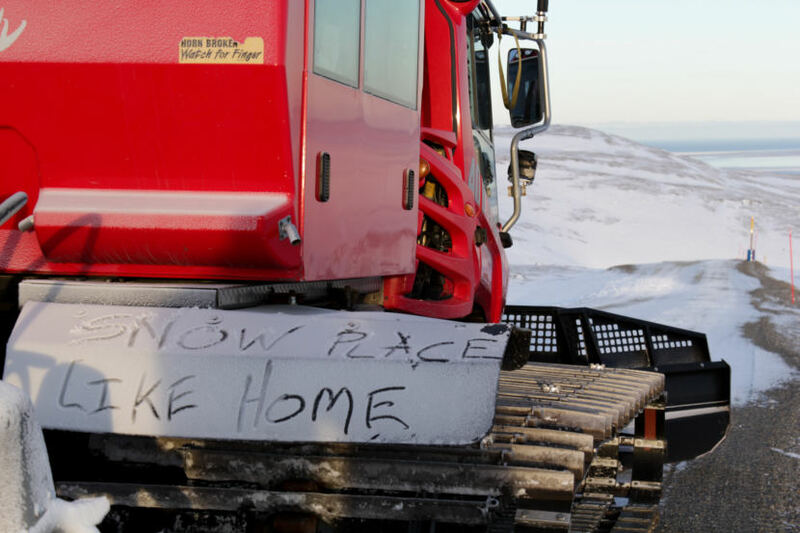 Workers used to make this trip via a long tram ride, but now the technicians use a treaded vehicle called a PistenBully, which looks like a cross between a bulldozer and a tank. Driving the machine was our guide, Jeff Boulds, a mustachioed Montanan with graying hair who wore only a sweatshirt in spite of the 14-degree weather. Boulds is in charge of the radar equipment itself. Instead, he maintains the sites’ facilities. “That’s everything from the toilet to the runway, and everything between that,” he said of his role. Most of the contractors have backgrounds in either the oil industry or military. Boulds’ last job was on the North Slope, and he said he is unbothered by the solitude and pace of work at remote radars. During the Cold War, sites like this were precautionary monitoring stations that could detect Soviet bombers. Tin City is only a few dozen miles from Russia, though on this particular day clouds obscure the mainland. But Big and Little Diomede islands are in plain view, the international date line running invisibly between them. The PistenBully arrives at the top of the mountain, and, in spite of the comparatively mild winter up to this point, the radar building is ensconced in ice, wind-strafed piles built up atop every metal surface at improbable angles. A technician uses a gloved hand to clear icicles off the front entryway. Last winter, the site was inundated with storms, which piled dozens of feet of snow on top of the building. Lemon talked with the site techs about how extra personnel had to be flown into Tin City just to dig out a path into the radar station with pickaxes. Inside the radar building, most of the equipment is classified, Boulds explained. Both floors are filled with what look like lockers, metal filing cabinets and fluorescent lighting, all of it giving the impression of an accountant’s basement much more so than a high-tech military site. Though the contents of the radar station have changed as the technology has shrunk from enormous vacuum tubes to microchips, the physical building itself is the same. Boulds leads us up a metal flight of stairs, the room filled with a high-pitched oscillating hum. “That’s the radar turning up there,” Boulds said, pointing to a dark hole in the ceiling. Everything at Tin City — from the runway for the plane to the cafeteria that keeps Boulds and other techs fed — it all exists so this machine can keep spinning. The long-range radars are basically eyeballs, monitoring the skies over the Bering Sea and Arctic Ocean for whatever flies through — be it military craft or rogue commercial planes. The signals picked up by radars like these feed information back to installations at JBER and NORAD’s headquarters in Colorado. For the military, maintaining command over U.S. airspace means being able to know what is moving through it. Even at the remote fringes of the continent. But how the military is planning to adapt in order to maintain that capability amid a warming Arctic is not clear. Already, the military is spending big to slow down impacts from climate change on its radar stations. According to Lemon, at the Cape Lisburne site near Point Hope, waves from the encroaching Chukchi Sea were washing over the airstrip. “So we have a $47 million seawall project. They’re actually building a seawall to protect that runway,” Lemon said. Seawalls to buffer vital infrastructure are likely just the beginning. Cape Lisburne was, in several ways, low-hanging fruit: A runway right next to the ocean, with a quarry nearby to gather rocks for the seawall. Some Northern sites will need boulders barged in to fortify coastline. Others will have to figure out how to deal with thawing permafrost. While the military acknowledges the problem, the actions they have so far pursued tend to emphasize collaborative planning among stakeholders. As of yet, there is no long-term strategy beyond keeping the radars spinning.